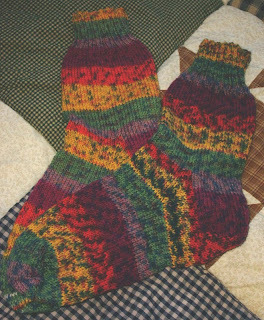 I have used the Online yarn again & for the first time I been disappointed, as I had nearly finished the 1st sock which is the one on the bottom out of the 2. I had a join in the yarn it was when i was on the green it had a little of the washed out pink bit then went back to green so cut out that bit & joined it so it be all green & finished the sock which wasn't that much more anyway. Go to try to get to the start for the 2nd sock & it was out of order the yellow came after the green not before so had to undo the whole ball & re-wind it so it now in correct order. But for those who have a keen eye will notice a slight difference with the yellow it has much more green in it so it not quite the same as the first so I am not a very happy bunny. On a happier note I got some sewing done yesterday I managed to do a table runner top so now have 2 table runners & a single quilt to quilt which I hope to do this week. As you may have guessed I am feeling better than I have been I still have to watch what I do no sudden head movements & if I have to look up or down I have to be careful but am better than I have been Thank You all for your kind thoughts, prayers & concern. Glad to hear you are feeling better. It's a shame with the sock yarn. It's aggravating when the yarn has joins in the middle. I like the one on the bottom with more yellow the best. I'm glad to hear that you're feeling better. I like the socks, and so sorry you've had trouble with the yarn. Sorry you had all that trouble with the wool, but at least you've finished them now. I'm glad you're feeling better now. Janice, I love your socks. I am so glad you are feeling better. Love your socks, they turned out just fine. Sometimes we are the hardest on ourselves. Don't look back, just keep on knitting !